The most scenic dunny (toilet) I have ever had the pleasure of doing my business in, in Kyrgyzstan. Those rumblings in your belly. That sharp, stab of pain, sinking feeling of dread and the immediate need to seek a toilet, where you may find yourself settling in for a long night. If you travel enough, especially to countries where the food or water quality may be lower than what you’re used to, you’ll probably have experienced traveller’s diarrhoea, at some point. It’s nasty, it’s messy and it can ruin a holiday. I’ve been hit by Traveller’s Diarrhoea a handful of times in my travels. It’s made these experiences memorable, in some cases certainly not for the right reasons. 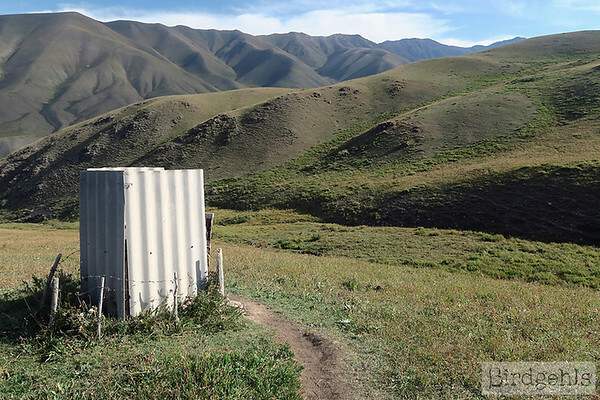 It hit me in Kyrgyzstan, where all I had was squat toilets to relieve myself in and while I was on a two-day horse trek, often no toilet at all. I travelled to Paris the day before my 26th birthday and started feeling ill whilst sat on the night bus on the way over from London (VERY UNPLEASANT). My plans of eating tarte aux fraise and chocolate crepes all weekend were left in the dust on the other side of the Channel. The most memorable incident was during a two week holiday in Cuba, the worst illness I’ve ever experienced abroad. It was straight after my 27th (there’s an unfortunate pattern here) and completely ruined my first few days in the country. These experiences have left an emotional scar and I take many precautions now when I’m heading abroad. I travel with a filtered water bottle and I’ve bulked up my first aid kit, particularly with a lot of gastro-stop. I avoid ice in any drinks and I think carefully about what I eat when I’m on the road. However… I tend to have food in mind when I travel and am always looking for interesting places to grab a meal. It makes me sad to have restrict my eating so that no further turmoil is caused to my guts. This is why I am incredibly pleased to learn about Travelan. 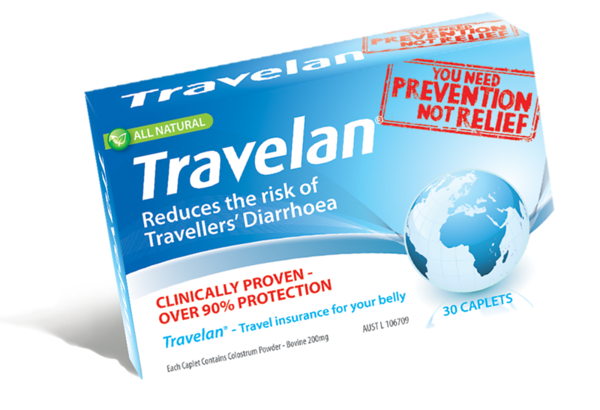 Travelan is an over-the-counter medication specifically formulated to reduce the risk of Traveller’s Diarrhoea. This means that you don’t have to wait for icky feelings in your gut to make themselves known – you can dispense with them altogether. In Australia, it’s offered over the counter at many chemists and pharmacies. This means you don’t need a script from your GP to grab it, which will save you some cash dollars that you can direct towards your holiday instead. Say you travel to country where malaria is a risk and you take Doxycycline to cover yourself for each day you’re there. It’s preventative – you use it in conjunction with insect repellant and if you’re bitten, your chances of contracting malaria are reduced. Well, Travelan works in a similar sense. There are a few causes for traveller’s diarrhoea, but the main one is caused from bacteria – particularly Escherichia coli (also known as E. coli). This is the one that can really knock you out, with crippling abdominal pain, fevers and often explosive diarrhoea. Travelan capsules contain Hyperimmune Bovine Colostrum enriched with anti-E.coli antibodies to prevent the infection of these bacterias in the first place. The capsules are administered orally. You take one with water before every meal. It’ll then lay within your gastrointestinal tract and neutralise any bacteria before it can make you sick. Travelan is a listed medicine in the Australian Register of Therapeutic Goods and sold as a dietary supplement in the USA. If you want to know more about the science behind this product, you can read more about Travelan here. Of course, Travelan is best taken in conjunction with other preventative measures – don’t forget to ‘boil it, cook it, peel it’. When it comes to your health, no risks should be taken. Where should you take Travelan? Any country where it’s recommended to avoid tap water, peel fruit and such. This would include most of Asia, some parts of Europe and generally Central and South America. In general, traveller’s diarrhoea can hit you in any country which has lower health standards than your own. Travelan does contain bovine products, so vegans and people with some food allergies will be unable to take it. These products include milk protein, lactose and glucose. On the upside, it doesn’t contain gluten, so it should be fine for coeliacs or those who travel gluten-free. If you’re unsure as to whether this product is right for you, consult your GP before purchasing. Shortly after recovering from traveller’s diarrhoea in Cuba, still not feeling 100%. 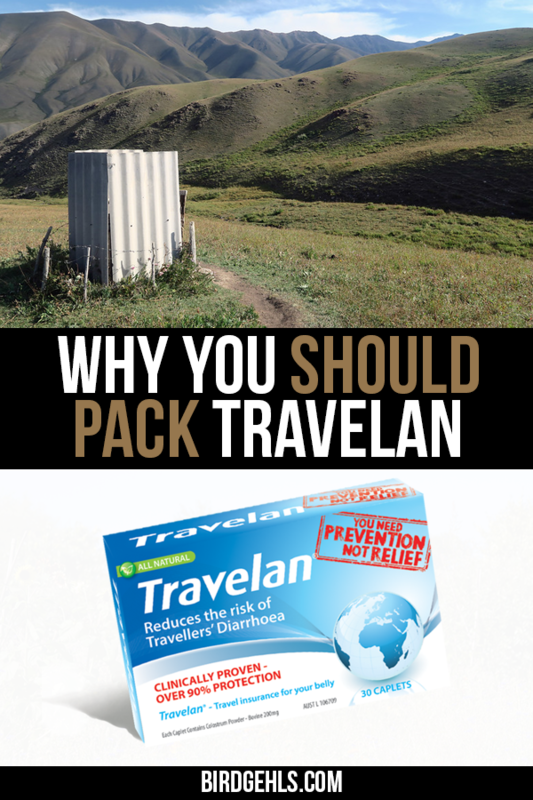 Travelan is something I’ll definitely be packing next time I jet overseas to somewhere that has a high risk of contracting Bali belly – whether that be Bali or not. Probably not. As I noted earlier, it can appear when you least anticipate it – I certainly never expected to get food poisoning in Paris! Okay, to be fair, I’m pretty sure it was contracted from the sushi I ate in London before hopping on that night bus. However, I’ll be looking to do everything I can to prevent traveller’s diarrhoea, whenever I next hop on a plane to travel to some exotic location. 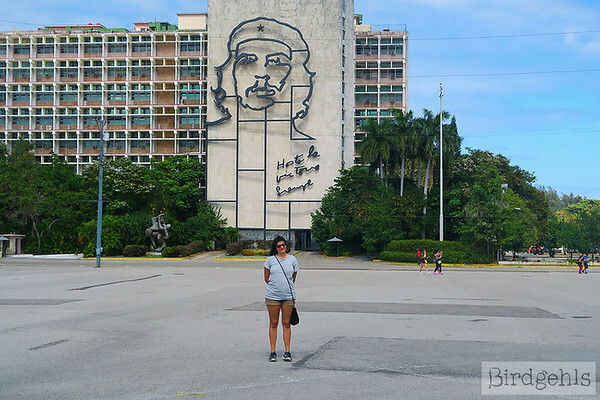 My trip to Cuba in particular demonstrated just how easily a whole trip (to a highly anticipated destination to boot) can be ruined with often a simple sip of a drink or bite of what appears to be a delicious dish. Lesson learned and going forward, I’ll be doing all that I can to prevent myself from getting traveller’s diarrhoea again – with the end goal of being able to eat as much delicious food as possible! If you’re in Australia, you can purchase Travelan online at Chemist Warehouse or through the Travelan wesbite. If you’re reading from the US or Canada, you can purchase Travelan online. Travelan is also available in-store at selected pharmacies, so you can pick it up whilst updating your travel first aid kit. If you’re after more information, you can read about the clinical studies conducted by the US Defense Force here. If you want to read more posts about bodily functions (I am not here to judge!) then check out this post about travelling with your period – the environmentally friendly way. Disclosure statement: This is a sponsored post, written in conjunction with Travelan. The information in this article is based on my own personal experiences. I am not a medical expert and if you have a strong case of traveller’s diarrhoea, seek medical assistance immediately. Please read my disclosure for more information regarding sponsored content.